Hollywood icon, heartthrob and a genuine gentleman – at the age of 55 years George Clooney is far from ending his career. Even though most of us know and love this sophisticated man of the world, there are a few things that you may not know about him yet. George Clooney is a prime example of an inspiration to achieve your goals without having an academic degree. Although he matriculated at the universities of Cincinnati and Kentucky, he never actually graduated. Of course, this is not the ideal way which life inevitably works out for everyone of us but it still shows that sometimes in life you have to be willing to take certain risks to get closer to your bigger goals. For the pleasure of colleagues and friends, George Clooney is notorious for his genius pranks. Once, he booked an expensive callboy to show up at a set for his acting colleague Brad Pitt. He also was willing to pay $5000 dollars to anyone who would spray Pitt’s car with pepper spray and on top of that, paint it orange! Another friend of Clooney, Matt Damon had to deal with a seamstress who was comissioned by Clooney to sew his suit smaller on a daily basis. Being a lover of Tequila, it was one of his personal wishes to create the “best tasting, smoothest tequila around”. One that you don’t have to cover up with salts, lime or lemons. Quickly, he and his longtime friends Rande Gerber and Mike Meldman went into business for themselve’s and have been producing Tequila in Jalisco, Mexico ever since, which initally wasn’t event intended for the public. A bottle of “Casamigos” Tequila costs approx. €80! Actually, it’s bad manners for a true gentleman to employ such unconventional methods, but as soon as the hormonal balance goes a little crazy even a womanizer like George Clooney makes use of them. His wife Amal, a human rights advocate, hasn’t really been taken with him after they first met on a charity event. So he simply asked her out on a date via e-mail. Well, at least no real ones. To avoid bad mood while filming serious scences at the respective sets George Clooney makes use of a good old whoopee cushion to brighten the mood. 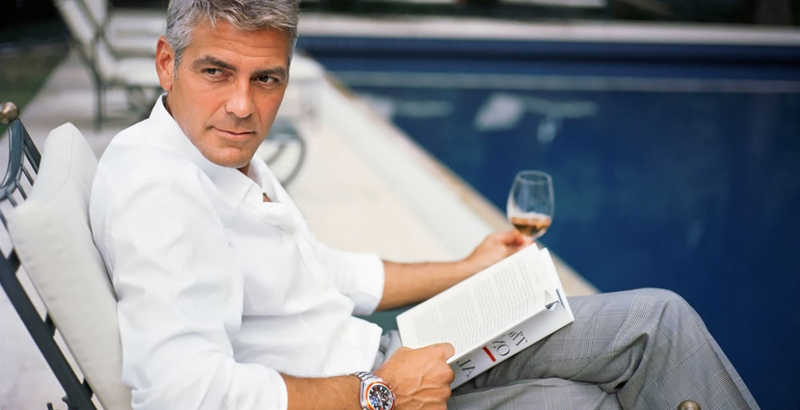 George Clooney sells his dream home "Casamigos"